He lived in a period when England was traditionally divided into two classes, the Rich and the Poor. The rich were able to look after their own and the poor had the Workhouse but middle-class widows with infants had nowhere to turn for support and relief from poverty. 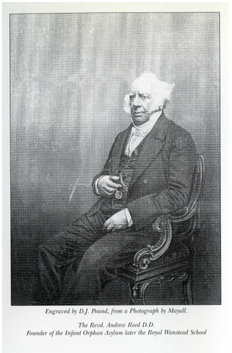 In 1813, Andrew Reed built both the East London Orphan Asylum (LOA) and Working School in Clapton, for children over the age of seven, with money raised from many city institutions, including the Stock Exchange, Livery Companies, the East India Company, Bank of England etcetera. There were many supporters from society, including the Royal Family. The LOA was founded for “the protection of fatherless children who are respectably descended but without means adequate to their support”. This institution later moved to Watford, then in 1946 to a pleasant country location outside Cobham, in Surrey, where it became Reed’s School and is still in operation today. The most prominent of the charity’s loyal supporters was Reed’s friend the Duke of Wellington, who helped him acquire a piece of Royal land located on the edge of Epping Forest on which Reed planned to construct his Infant Orphan Asylum. Work on the new building, designed by Sir Gilbert Scott, began in 1841 with the foundation stone being laid by Queen Victoria’s husband, Prince Albert. Two years later (in 1843) Queen Victoria’s uncle Leopold, King of the Belgians, performed the opening ceremony. The establishment housed 600 children, making it one of the country’s largest schools as well as one of the best-known charities with Andrew Reed becoming a household name. Unfortunately, by the time the doors opened, Reed had quit in distress after disagreeing with his colleagues’ insistence on exclusively Anglican teachings thereby denying entry to the children of nonconformists like himself. Distraught at abandoning his proud creation, Reed applied himself to launching three further charities. 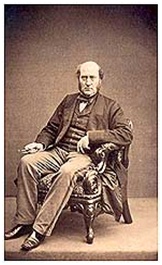 Sir George Gilbert Scott (1811-1878) was born in Gawcott, Buckinghamshire. He started in architecture by designing gaols and workhouses, but later studied French Gothic Cathedrals and Churches, being much influenced by the ideas of Augustus Welby Pugin who favoured Gothic style and traditional craftsmanship over the increasing mechanisation of 19th century society. He represented the quintessence of High Victorian Gothic architecture, and was responsible for an immense amount of such work. He was concerned with the creation, restoration and alteration of some 730 buildings. His first work was The Infant Orphan Asylum. 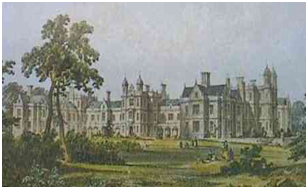 Scott worked on more than 850 buildings in England and Scotland – cottages, stately homes, gaols, university buildings, town halls and government offices. However, his most important legacy is the restoration of almost 500 churches and 39 cathedrals. Scott won a Royal Gold Medal in 1859 and was knighted in 1872. He died in 1878 and is buried in Westminster Abbey.